Sister hopes Twitter will help find suspect. "I never thought it would be this long without answers." Kelsi German's every day revolves around the search for her sister Libby's killer. "I think it's crazy that it's been almost two years now," Kelsi said. Through her struggles over the past two years, Kelsi was put in touch with a woman who can relate to what she is going through. Michelle Cruz's sister, Janelle, is believed to be the Golden State Killer's final victim. Janelle was murdered in 1986, but the man believed to be responsible for her death wasn't arrested until this past year – nearly four decades after his first murder. "I felt her exact pain, so Kelsi and I had an immediate bond," Michelle said. "I was 17 when my sister Janelle was killed by the Golden State Killer and she was 17 when her sister was killed, so we could just look at each other and feel the same pain." "We are sister survivors because the family of victims are the victims too," Kelsi said. Before he was arrested, Michelle spent her time speaking out on social media. She believes her online campaign helped lead to the killer's arrest. She's now encouraging Kelsi to do the same to find her sister's killer. "My advice would be to advocate as much as possible, not only will it help the case, it will help your soul," Michelle said. 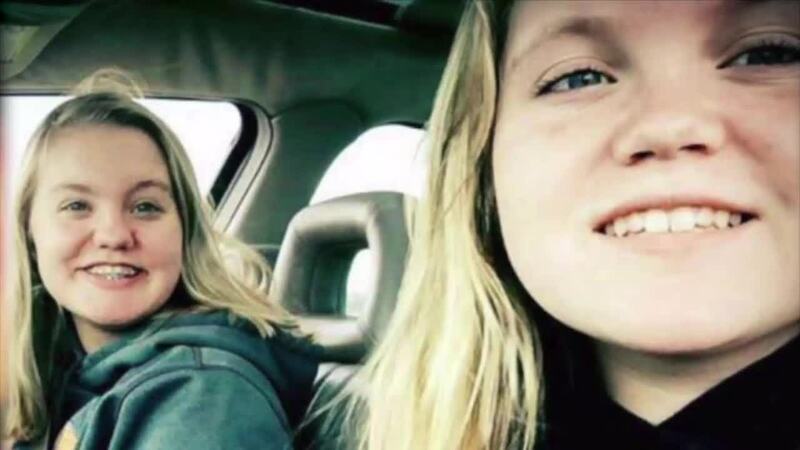 With Michelle's help, Kelsi created a Twitter account that is focused solely on finding the suspect who killed her sister and their friend Abby in 2017. That account - @LibertyG_sister – has helped Kelsi connect with people across the globe and spread the word about who Libby and Abby were and to keep the search for their killer alive. "I've met so many people who are connected with the girls because of my posts," Kelsi said. "Before maybe, they didn't see it as an important case to look at, but now that they are seeing my posts it is." Through that account, Kelsi says she can share her memories of Libby. Glimpses at the life before the tragedy and to help people get to know, even just a little, who she was. "We can make them real people to people that didn't know them," Kelsi said. "We know how great they were. We know the memories that we have with them, but other people seem them as another murder victim. So, she taught me that it was good to share the pictures of the memories we have with the girls to help people be more familiar with the people they were." She says Michelle has been instrumental in her social media campaign. The girls talk at least once each week, and Michelle keeps Kelsi accountable for updating her Twitter page regularly. "It's really hard for me to remember to post on there every day, so she'll message me and say ‘hey, haven't seen you post in a couple days, maybe you should post something.' So she keeps me up-to-date on my Twitter because she knows she had a post every day and she had someone keeping her up to date too. So, she's kinda helped keep me on track with my Twitter updates." 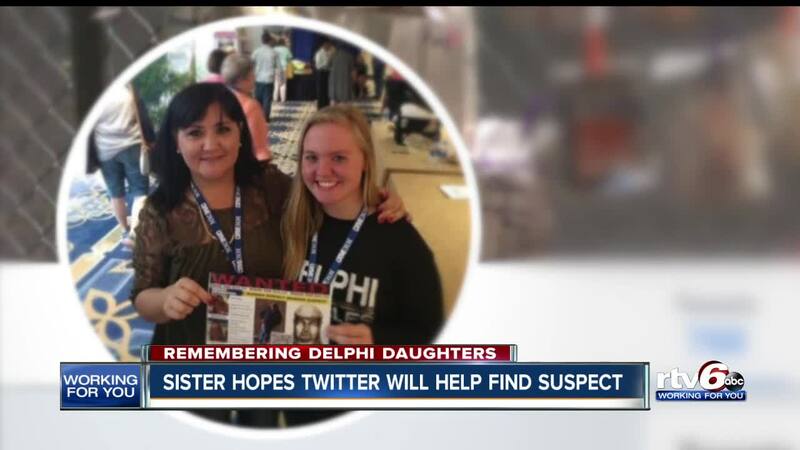 Not only has social media helped Kelsi spread the Delphi killer's image, but she says it has also helped her to realize she isn't alone. Through the power of social media, Kelsi says others facing similar tragedies in their lives have reached out to her, shared their stories, and some are helping her share hers. "Having Michelle by my side is just as great as having them on my side, if not more so because she's experienced more awful things than I could ever imagine because she does know the facts behind her case and I don't. But, because of that, she helps me stay the strong independent person that I have become because of it," Kelsi said. "She's a big support system for me; It's actually really great." "She has so much faith that this case will be solved. Her advice to me was it's going to be 42 months, not 42 years – because that's how long it took them." Kelsi has made it her life's mission to find her sister Libby's killer, but she also hopes to use what she has been through to help others facing similar tragedies. She says she's taking her life in a new direction and has decided to change her major to biological forensics. Her goal is to help police solve crimes like her sister's murder. "I want to be the person that can get it done and relieve the pain from all the people that are suffering," Kelsi said. "I want to solve crimes because of what I'm going through, and I want to help people because of what I went through and what my family has been through." She also wants to help shorten the waiting period for another family that is waiting for an answer. Her passion comes from more than a career choice to her it's more than just a job – she knows what it's like to wait. "I want to be able to solve crimes and get them solved faster than is happening now," Kelsi said. "It's almost been two years, and I wish it would've been solved two years ago." She credits the Indiana State Police's lead investigator for helping her decide to explore her career path, and she hopes she can use the things she has learned from her sister's murder to help other families. "The one thing I've heard the most when you go into this is you're going to see some really bad stuff, but I think I've been through some really bad stuff so helping them with their really bad stuff will help me feel better about my really bad things," Kelsi said. Kelsi says she hopes to transfer, perhaps to Purdue, to major in forensics. Michelle Cruz's book about the Golden State Killer called "Evil Has a Name" is available on Amazon.